Recently, I am concerned that my nails seem to be getting weaker and weaker. Not sure the reason why at the first. I do change my nails frequently before without running into this kind of problem. My daily manicure routine always requires a bast coat/strengthener, which ensures that my natural nails won't be yellowy and weaker at the same time. My all time favorite is Sally Hansen's nail strengthener which I believe it was discontinued long ago. Unfortunately I don't have a picture of it. It is a orange bottle. I am using Sally Hansen's Miracle Cure Strengthener now. It is not as good as the old one, but it does the trick for me. However, apparently it no longer can give enough strength to my nails as before. I really don't know the reason why and I already used up 3 bottles previously and it works great. In the meanwhile, I start looking for a better replacement. I went to Sally Beauty store recently and picked up two nail strengtheners to try. My nail polish remover was running low as well, so I also picked up another 946 ml acetone. This nail polish remover is very cheap, they often on sale for $5 dollars. Best money saver!! When I start to use the new bottle of nail polish remover, it does much better job of removing polishes without over-drying my hands! I was shocked. Both of nail polish remover are from Sally Beauty, how come they are so different? 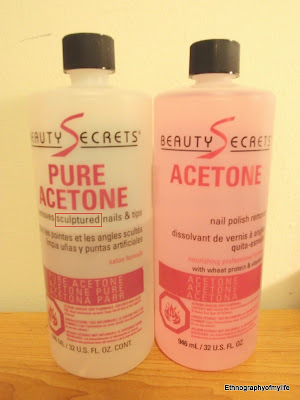 Yes, I compared the two bottles, the old one is "PURE ACENTONE" and new one is "ACENTONE". You don't have to tell me that they got different colours how come I mess up. I am blind LOL. Guess what? "PURE ACENTONE" one is for sculptured nails. SCULPTURED. It states on the front and also the instruction on the back. I never read it and that's the REASON WHY MY NAILS BECOME SO WEAK. Yeah, I use this for like 3-4 months already. Eep! Well, at least you figured that out. Do you think your nails will recover when you stop using it?